Flavoured pastas look wonderful in this simple dish. 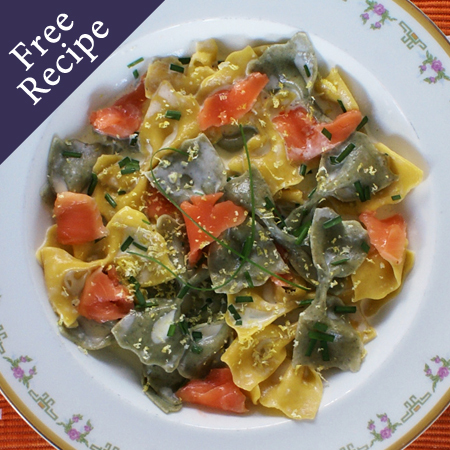 Try spinach, herb, carrot, capsicum, turmeric, tomato pastas or use a mix of several. If you want to make a more substantial lunch, increase the amount of pasta used. 2. In a small saucepan over low heat melt the butter then add the crushed garlic and fry for 2 minutes. Add the cream stirring to combine. 3. Add the lemon juice and zest (reserving a little zest to sprinkle on top). Mix well. Keep warm while pasta cooks. 4. When the pasta water is boiling rapidly, add the farfalle, immediately stirring to separate. Boil uncovered until the pasta is al dente (3 – 4 minutes). 5. While the pasta is cooking add the salmon to the cream sauce to warm up, breaking it into pieces as you add it. Add the chopped chives, reserving a little for garnish. 6. Drain the pasta, then put in a serving bowl. Tip over the sauce and toss to mix through. 7. Garnish with zest and chives then serve immediately with extra lemon wedges if desired. Dill makes a great substitute for the chives if you have it. Cooked peas can also be added to the sauce for a vegetable boost.